How Do The Ducks Stack Up In The Pac-12? The Pac-12 has been a revolving door for the past decade. The conference has had three notable powerhouses over the last ten seasons: Pete Carroll’s USC Trojans, Chip Kelly’s Oregon Ducks, and now David Shaw’s Stanford Cardinal. Are the Ducks now truly a middle-of-the-pack team this season, are they sleepers, overrated? 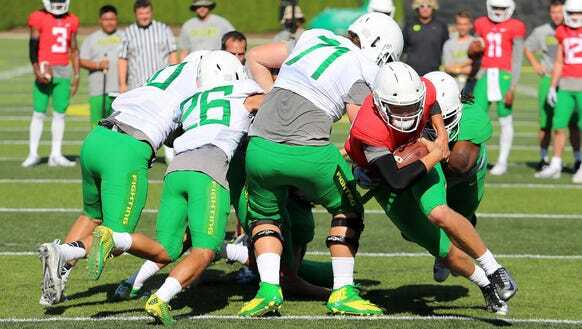 Let’s see how exactly the Ducks stack up against Pac-12 competition this season. There are four Pac-12 teams you need to keep an eye on this season when it comes to opponents: Stanford Cardinal, USC Trojans, UCLA Bruins, and the Washington Huskies. For the Ducks, it is hard to start comparing them and making predictions with so much uncertainty having previously surrounded the starting QB question. You usually don’t want your name to be in the same sentence as Johnny Manziel, but that’s whom Prukop draws comparisons to. In two seasons, Prukop has produced a total of 79 touchdowns, including 24 with his legs. Prukop is able to buy time with his mobility and able to make a tough throw due to his strong arm. Prukop has the instinct to make plays, and the Oregon Ducks weren’t the only one to notice this. Alabama, Texas, and Michigan all were interested in the transfer quarterback. When you look at the Ducks’ schedule, they have a pretty easy first five games. They will take on UC Davis, Virginia, Nebraska, Colorado and Washington State. As far as the Pac-12 goes, I wouldn’t sleep on Washington State, as they have a high-powered offense driven by Luke Falk. The Cougars don’t have the depth or overall talent as the Ducks, so the Ducks should be able to win that game. The first true test of where the Ducks stack in the Pac-12 will be when they play the Washington Huskies on October 8th. The Huskies were ranked 13th in the nation and 1st in the Pac-12 with only 18.8 points allowed per game. The Ducks were able to pull out a win in Seattle last season, but this year is a different team. A win against Washington should be expected out of a program like the Ducks, but a loss would set them back in the power rankings of the Pac-12. With no UCLA on the schedule, the next two teams the Ducks will notably play are USC and Stanford in back to back games. The Ducks and Trojans have always compared to one another and fought for the Pac-12, with the Ducks winning in a 48-28 rout last season. If the Ducks can beat the talented Trojans again, they will be in a great position when it comes to their division. The ultimate test will come against Stanford on November 12th. If the Ducks stay relevant, this game can have major Pac-12 implications. As it stands right now, the Ducks do not stack up well against Stanford, no team does really. If Prukop can live up to the hype and the Ducks knock off the Huskies and Trojans, they will be playing for all the marbles when it comes time to play Stanford. As it stands now, the Ducks probably stack up 4th or 5th in the Pac-12. They can move up the ladder with a win against the Huskies, but the true test will come November 5th and 12th against USC and Stanford.